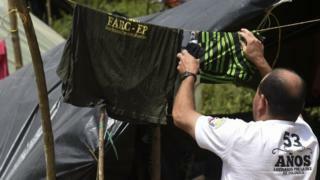 The Colombian government says it has started the process of training Farc rebels as bodyguards. Under the peace deal signed by the government and the Marxist rebel group last year, 315 demobilised guerrilla fighters will be trained to protect fellow Farc members at risk of violence. Right-wing paramilitary groups have been known to target Farc leaders. Once trained, they will be given a gun and paid three times the minimum wage. The interior ministry said that more than 300 demobilised rebels had arrived at a training academy in the town of Facatativá, near the capital, Bogotá. More are expected to arrive in the coming days. The ministry says a total of 315 candidates will be chosen for the task of providing security for Farc leaders. They will undergo a series of exams to test their physical, psychological and emotional aptitude for the job. The successful candidates will be paid a monthly salary of 1.8m pesos ($615; £485). Only Farc members who have not committed crimes against humanity and who can prove they have handed in their arms are allowed to apply. They will receive training in human rights and close protection by Colombia’s National Protection Unit. But the fact that the rebels will be allowed to carry guns just months after having handed them over to a United Nations monitoring team has disgruntled some Colombians. Those unhappy with the deal say it is unthinkable that members of the Farc, who for more than five decades fought the Colombian state, should be allowed to carry guns legally and even be paid by the state to do so. But Farc negotiators argued that their leaders’ security had to be guaranteed and that they only trusted their own people to do so. To justify their demand for heavy security, they pointed to the murders of members of the left-wing Unión Patriotica party in the 1980s. The party was almost completely wiped out after dozens of its lawmakers and local councillors were killed.